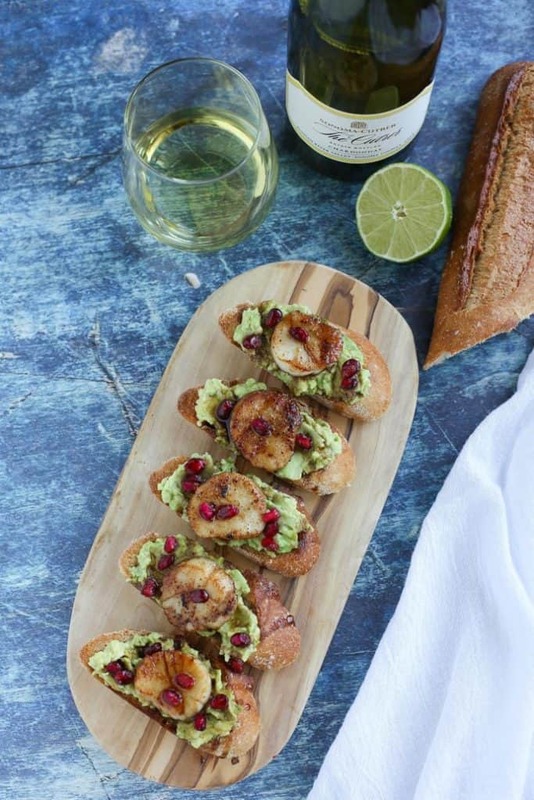 This Crostini with Scallops and Avocado is the perfect appetizer for all your holiday parties. The scallops are sauteed to perfection and placed on top of crunchy crostini spread with avocado. A drizzling of balsamic syrup really takes the flavor over the top. This post is sponsored by Sonoma-Cutrer but all opinions are my own. Hope all your holiday planning is coming along nicely. We have hosted a few get togethers this year and the appetizers are always so much fun to put together. I love keeping it easy so I can relax and enjoy the party too! 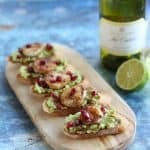 The best way to do that is to have a nice mix of easily assembled appetizers plus a few that require a bit more effort like this Crostini with Scallops and Avocado. These make a beautiful addition to any party spread with their festive colors. The scallops are pan seared until they get that beautiful browning on the outside. Adding the balsamic drizzle really makes the flavor pop. To get perfectly seared scallops you need to use a screaming hot pan (I like to use cast iron) and make sure your scallops are dry. I put mine between paper towels and let them sit for a few minutes. Add olive oil to the pan and sear those babies for about 1 1/2-2 minutes on each side. Do not crowd the pan and try to resist moving them around. If you leave them alone, they will come out perfect! Now that we have the perfect Crostini with Scallops and Avocado planned, let’s think about the wine, shall we? 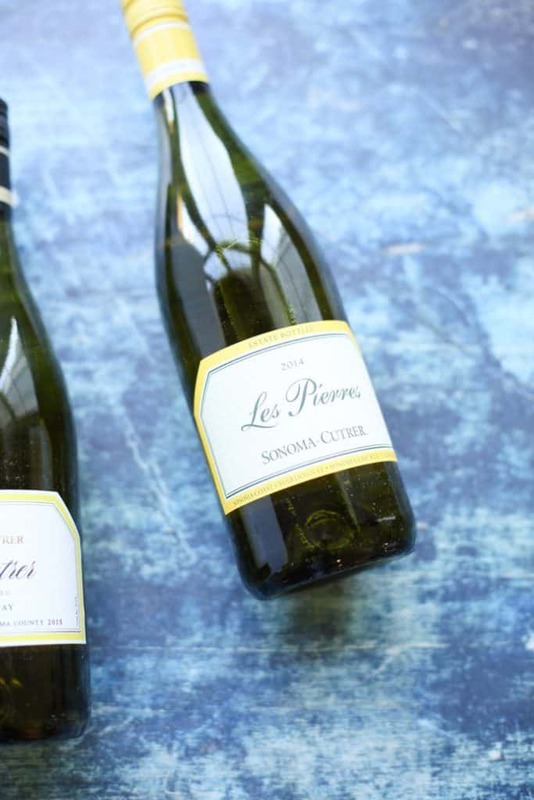 I love white wines with bright, citrusy notes like this Les Pierres Chardonnay. You can taste the hints of grapefruit and lime and a background oaky flavor in every sip. It goes well with just about any party food and is a real crowd pleaser! Trust me, your guests will love it! Another favorite is The Cutrer Chardonnay. This lovely wine boasts flavors of peach, apple and creme brulee. It’s the perfect sipper for the holidays and has a long flavorful finish. Sonoma-Cutrer is a traditional winery that pairs Burgundian traditions with Californian ingenuity to come up with these beautiful signature wines. I promise they will not disappoint at any of your seasonal gatherings this year. In fact, you can easily order your wine here and have it delivered. How easy it that? So host a neighborhood open house tonight. Put together a cheese tray with fig jam, olives, nuts, and grapes. 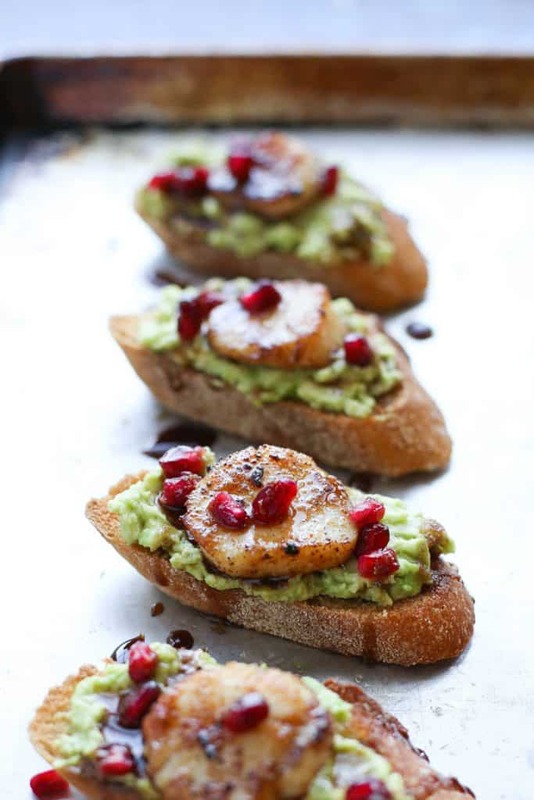 Make these lovely Crostini with Scallops and Avocado and you are all set! Don’t forget to serve some Sonoma-Cutrer for a lovely counterbalance to all the savory treats. Slice scallops in half horizontally to make them bite sized for the crostini. Lay scallops on a paper towel and lay another paper towel on top. Sit aside. Preheat oven to 350º. Scoop out avocado flesh and place in a bowl. Drizzle with lemon juice, salt and pepper and mash with a fork. Lay sliced toast on a sheet pan and drizzle both sides with olive oil. Cook at 350 degrees for about 10-15 minutes. Flip over if necessary. Heat a skillet to medium-high and add 1 tbsp of olive oil. Salt and pepper scallops. When hot, place scallops in pan and cook for about 1 1/2 - 2 minutes per side. Remove and set aside. Assemble crostini. Spread each toast with avocado mixture. Top with scallops, pomegranate seeds and drizzle with balsamic syrup. Serve immediately. What a beautiful and amazing appetizer! LOVE the flavour profile here! and crostinis are wonderful this time of the year for all those holiday dinners and parties! Scallops and avocados are the perfect combos.I bet this will be a big hit on holiday parties. Saving this! Perfect for New Year’s Eve! Oh that drizzle! These look delicious. I’m a huge fan of scallops so pinning this for later. Always need great appetizers. Sounds great and such a lovely presentation. YUM! These crostini look so delicious and a great snack!